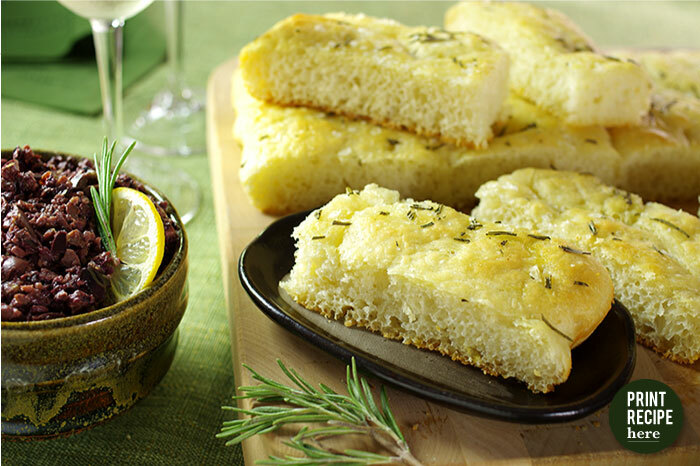 This recipe is the perfect beginner’s focaccia. 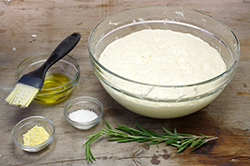 It’s simple, easy, and allows you to taste the wonderful dough with very little accoutrements. We suggest that the olive paste be served on the side. 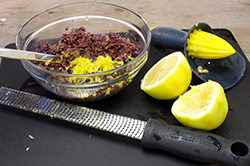 A tip we learned is to add softened butter to the olive paste to tame it down if it’s too strong for your palate. 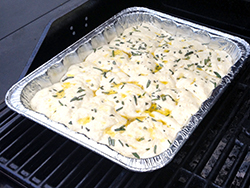 Because the bread dough is soft and thick and the toppings are placed on the dough at the beginning, we use an aluminum pan to hold it together and to grill-bake it. Prepare an indirect medium-hot fire in your grill, with heat on one side and no heat on the other. 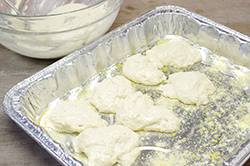 For the flatbread, lightly sprinkle the cornmeal in the bottom of a 12 x 10-inch disposable aluminum pan. Dollop the dough down the center of the prepared pan. 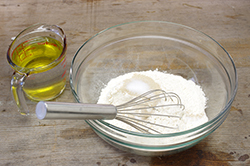 Dip your fingers in olive oil and carefully spread the dough to the edges of the pan so that the dough is an even thickness throughout. Lightly make some indentations all over the dough. 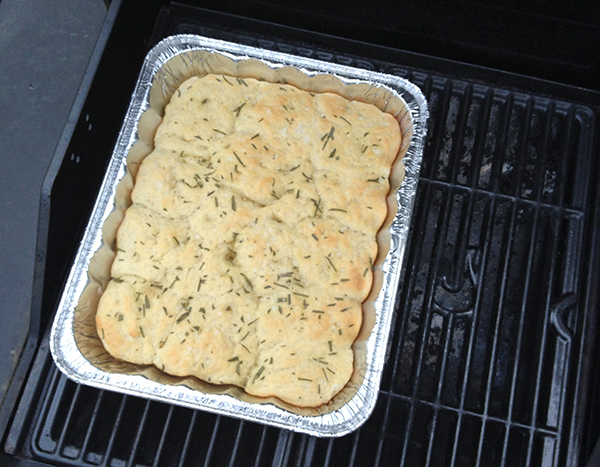 Sprinkle the rosemary leaves evenly over the dough, drizzle with olive oil, and sprinkle with the salt. 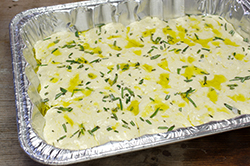 Set the pan on the indirect side of the grill or on top of 2 or 3 bricks placed on the grill grates to elevate the focaccia. Grill for 15 to 18 minutes with the lid closed. Check to see that the middle of the dough is 190°F. 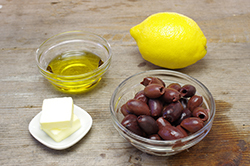 For the Kalamata olive paste, while the bread is grill-baking, combine the olives, olive oil, and lemon zest and juice in a medium bowl. Stir in the butter, if you like. This can also be made in a food processor, but don’t overblend. A simple stir in a bowl, a rise on your kitchen counter, a quick pat or roll into shape, and you’ve got flatbreads ready to sizzle on the grill grates. The loose, floppy dough makes irregular shapes rather than perfect pizza rounds, which adds to the rustic appeal. For a vegan dough, substitute agave for the honey. 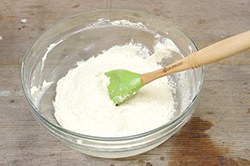 In a medium bowl, stir the flour, salt, and yeast together. 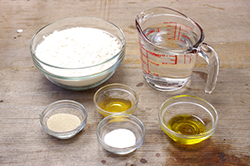 Combine the water, honey, and olive oil and stir into the flour mixture until the dough comes together. 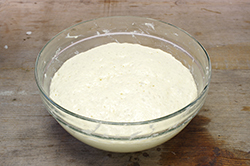 If the dough is dry, add 1 tablespoon of water at a time until the dough is just moist. Cover the bowl with plastic wrap and let sit at room temperature until doubled in size, about 1 hour. Use immediately, or refrigerate for up to 3 days before baking. Let come to room temperature before using.